It’s no secret that we love lifts. For the avid hiker, a well-placed chairlift, gondola or tram offers exciting possibilities, from lengthening hikes to getting home fast. Lifts carry us up. They shuttle us down. They whisk us to the pub at the end of a long day. 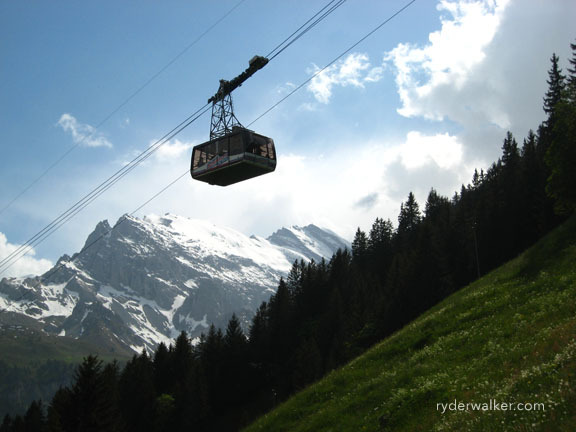 Lifts offer strategic staging points and, in the Alps, they are commonplace, offering a veritable spiderweb of transport between trailheads and chalets. It’s no surprise, then, that we were delighted when the team at Low-Tech Magazine sent the following article. Think chairlifts and trams are relatively new inventions? Think again. Low Tech’s piece suggests that lifts, also known as aerial ropeways, date back more than 2000 years. If you like history and/or mechanical things, then you’ll dig this article. We did. Enjoy. Image: The Schilthorn tram soars high above the Swiss Alps.